Sure. I first started to get interested in science in general at a pretty young age. I would say when I was thirteen years old because like many schools, my school asked the students to be involved in science fairs. For a science fair, you’re supposed to do something completely new, come up with a new hypothesis, and then find an answer to that. I hadn’t been exposed to any kind of active role in science before, so that was something exhilarating – just to be able imagine myself at the frontier of a new work. I could imagine myself as an explorer. I had very supportive parents and they helped me get in contact … I grew up in San Diego. They helped me get in contact with a professor at UCSD, Bill Loomis. He was extremely supportive. Actually, after I talked to him, he let me come into his lab for some time to carry out the experiments. As a thirteen year old who didn’t know anything, that was really fantastic. That was very exciting and I got hooked on the bug of being on the frontier of knowledge by being able to pose new questions. When Shih enrolled at Harvard as an undergrad, he joined the laboratory of Tom Kirchhausen, now at Harvard Medical School. In Tom’s lab what we were doing, and what he continues to do, is to study molecular machinery that’s involved in import of nutrients and other molecules from outside the cell into the cell. It was a lot of fun, but one thing I kind of found a little bit dissatisfying was that at that time, the exact molecular shape of these machines wasn’t known. Oftentimes in research you’re just trying to get bits and pieces of knowledge – because you’re at the frontier. I found that as the activity of science, somehow it felt a little bit dissatisfying to be constructing models of basically little blobs. What I learned about myself is that I like to think about things in more concrete terms. I like to have a face of the molecule. I learned I like having a three-dimensional picture to think about, a very detailed one as opposed to a vague one. The next thing I learned was that the molecules of life were not evolved for people to study them. They’re operating under different constraints. Nature doesn’t care about your PhD thesis or how hard it is for you to produce enough of this molecule that you can study it, and it has no sympathies about, well, you need to go to sleep. Wouldn’t it be nice if nature had made the molecule very stable so that it would survive to the next day so you wouldn’t have to start from scratch? I personally get more satisfaction out of trying to understand how molecules work by creating new ones and then trying to recapitulate functions synthetically. The idea of being able to build it myself and being able to build it in a way that would be easy to study would be much more satisfying. In a way it’s the same thing a biologist would select in a model organism. A yeast is very easy to study or fruit flies are very easy to study compared to a human being. A synthetic biologist to me just takes it one step further. Instead of selecting a yeast, they decide to build a new device, a new model system, and in a sense they have even more control over the ability to study these things. Evolution take its time. Can we – by following nature’s principles – accelerate the process in ways that serve our survival and the rest of life? These amazing machines were all created through this blind, very wasteful process. For evolution to work, billions and trillions of failed designs need to be discarded, but through the eons it produces this amazing function. Why does William Shih choose to work with DNA? If you look at most of the functional machines within the cell, most of those are proteins. Naturally, one might be drawn to using proteins as your clay to build functional devices. But what I realized and a lot of other people realized, is although nucleic acids like DNA and RNA are less versatile, they still can do some things, and they have the virtue that they’re much, much easier to work with. So it’s a trade-off. You trade off the versatility of proteins with the ease of human malleability and things you can do in a shorter time frame with DNA or RNA. There’s plenty that nucleic acids can do for my lifetime. I don’t need to do everything else that proteins do. That was the trade-off. I think proteins are wonderful, but nucleic acids are just easier to work with. For me, what do I mean by easier to work with? That means, for the same amount of effort, I think I can create a much more elaborate system. I can ask much more interesting questions to me. If it’s easier, that means for the same amount of time you could build something bigger and more complicated. DNA is an extremely important molecule. There’s two images I think that really pop out. One is that it’s this physical repository of heritable genetic information that determines our characteristics, how we differ from other people. It’s a genetic recipe for producing all the different kinds of molecules that end up building us. Then the second image that I think is powerful is the physical manifestation of it: the double helix. Everybody knows that DNA is a double helix. The founder of my field of DNA nanotechnology, Ned Seeman, he had this big, conceptual breakthrough which is: While I know that DNA has a biological role, the main biological role seems to be heritable information, so it’s just kind of passive…in a sense, passive store of coded information and that’s translated into functional molecules made out of RNA or protein. The physical form of the DNA itself in a sense is just symbolic. It’s not functional most of the time. I ask Shih what specifically makes DNA so appealing to work with? The key property of DNA that makes it so attractive as a building block for human engineers is that the rules for specific association of different sequences of DNA are so simple, local, and robust. DNA is a linear polymer of four different kinds of building blocks. We call them A’s, C’s, G’s, or T’s. We know that A’s are shaped complementary to T’s; C’s are shaped complementary with G’s. The opposite pairings don’t like each other so much. A doesn’t like to pair with itself, or G, or C. So on and so forth. What that means is that if you have a particular linear sequence of DNA that’s sixteen units long, then it really likes to pair with a sixteen-mer of the exact, complementary sequence. So something that’s A-A-C-G-T, that’s a five-mer really likes to pair with A-C-G-T-T, which is the exact base-complementary sequence. If you have any mismatches, any deviations from that, those sequences don’t really like to link together so much. That means that if you have a soup filled with all these different molecules, they’re constantly bumping into each other. If they have the perfect match of sequence, then when they bump into each other, they’ll end up sticking to each other for a long time, but if they have the wrong sequence then they’ll bump into each other and they’ll fall apart. If your goal is to try to build a specific structure out of these components that are jostling around, bumping into each other, then what you really need most of all is the ability to control the specificity of interaction. So that’s the trick for engineering self-assembling systems. How do you coax the molecules? You have these hundreds of different components and you’re just throwing them together and they’re jostling around. How do you make sure that they assemble into the right structure and not the trillions and trillions of wrong structures. Maybe a jigsaw puzzle’s a good example. If you have the thousand pieces of a jigsaw puzzle and you throw those into the drying machine and pressed tumble. If they just decided every piece liked each other, every other one exactly as much, then you’re not going to generate the correct solution to the puzzle. It’s only if they’re very picky and they reject all the fits that aren’t quite right. I can see that tapping into and directing molecular self-assembly has enormous potential, but I want to know why the small parts want to self-assemble. What’s in it for them? I think about it in terms of basically binding and letting go. At this scale – again think about it as jigsaw pieces that are tumbling in your dryer. Now if the two pieces of the jigsaw puzzle randomly bump into each other and they have really fantastic shape complementarity – they really fit together – there’s kind of an attractive force between the two. Then they’ll be able to resist the tumbling energy from the dryer. …the urge to stick will surpass the urge to tumble. Exactly…exactly… So, that’s basically a very good analogy to what happens on the molecular scale, because on the molecular scale we have thermal energy. It’s the temperature, heat-based jostling of molecules that’s opposing the attractive potential of these molecular jigsaw puzzles. It’s all about being above the threshold. If you have enough energy that holds you together, you’re able to oppose the thermal jostling. That’s basically self-assembly. The beauty of self-assembly is that it’s a very efficient means to construct intricate, three-dimensional shapes using – especially using very small components. It turns out self-assembly solves all the other problems of going from some simple linear strings to a complex three-dimensional shape, because the linear string is basically programmed by self-assembly to fold up on itself into a complex 3D shape. Then those 3D shapes will find each other and build up spontaneously the larger, higher three-dimensional shape. This has a lot of advantages. For example, scalability. What if you had some task and you wanted a thousand trillion of these molecules to make an army of little nano-fabricators or something like this? Well, it’d be difficult if you needed a million, trillion robots to build each one of those copies. Instead, if they just kind of build themselves, then… In that sense, it’s another advantage because they don’t necessarily require any auxiliary machinery to build. Right, once the process starts. So, how do you program them? There’s been some chemistry…amazing, Nobel prize winning chemistry worked out many decades ago that allows us to – using the tools of synthetic organic chemistry, just mixing big pots of chemicals together – not really self-assembly, just brute force chemistry – but it works. You can basically mash together in a single test tube trillions of copies of just one sequence that you specify. So the basic way that it works is that you might have a solid support that starts with the letter G. Then you bathe that solid support with the letter C, and using the tools of chemistry, the C will just … You’ll get one copy of C that will go on top of the G. But then that C is capped so it won’t grow anymore. After you’ve added the C, now you can wash away the extra C, and you’re left with C-G on your support. Now you can do chemistry to basically unmask the end of the C so it can now accept another sub-unit. Now you repeat the process. You have the cycles of add monomer, wash away, unmask the end, and then now repeat the cycle. In that way, you can build up any linear sequence that you want. It’s pretty remarkable synthetic chemistry that allows us to build up any sequence we want. What you’re throwing now into the dryer, the soup, whatever, is these strands that you’ve programmed? And so…given that you’ve programmed these strands, you kind of know where they’ll stick and where they won’t? And you can predict what the self-assembly will produce? Yes. The amazing thing is that we actually have that control. It has to do with the fact that for DNA or RNA, that they really, really like to stick when they have the perfectly matched sequence. They get a lot of energy…attractive energy when the shape is perfectly complementary, the sequence is perfectly complementary. If you have any mismatches, then it loses that attractive energy, and because those tendencies are so strong, we have a lot of control. And this is not at all trivial if we take a comparison of proteins. It turns out this is an extremely difficult problem because the rules of how proteins associate are far more complicated. Than for DNA or RNA. Again, this goes back to “life is short.” So, given our current state of knowledge, we’re going to make a lot more progress trying to build out of DNA. Eventually, people working with the proteins will… in a sense, they’ll catch up. Now that we’re able to program DNA and build with it, what are the practical applications? One of the class of applications I think people are most excited about for the so-called molecular robots are in the space of human healthcare. Can we create little molecular entities that help us to do early diagnosis of disease so we can treat the disease earlier before it’s too late? Or can we directly create therapeutics that can affect change directly on human health? [17:03] My favorite inspiration in this space is the immune system because that really has been described as the ultimate nanotechnology. That our body has limited physical resources and it needs to marshal them in very wise ways against the different kinds of threats. And our immune system has to be very smart about this because it can’t stockpile weapons against every possible threat to our body. It needs to make them on demand. It needs to know what kind of weapons to produce, it needs to know how much to produce, it needs to know where to send them. It’s making all these kinds of decisions, and it creates many different shapes in order to carry this out. It needs to program these molecular robots like immune cells to migrate to the right place. The body uses its own molecular robots…? That’s right. I’m talking about … It’s not just crazy talk. The body produces molecular robots. The body is the existence proof for advanced nanotechnology. [18:04] What we’re hoping to do is to use that inspiration to at least in an initial phase to create a pale shadow of that. It’s hard. To try to take the first steps to creating a synthetic and artificial version… weak, not very functional…semi-functional version of these advanced nano-robots that the body can produce, and through the fullness of time, eventually match the sophistication of what the body can produce. I can envision a world where fifty years from now – which is not that long really… I’ll probably be dead – but fifty years from now, what if we have the know-how to produce molecular robots that are in many areas as effective as the immune system. That would be amazing. Or maybe a hundred years from now we can make a lot of different robots that in many cases are far more sophisticated than the immune system. I think that’s possible as well. Completely different threats. Evolution on a natural scale moves much more slowly, so you can forgive nature for not producing people that are perfectly adapted to diets of high fructose corn syrup and trans fatty acids and watching lots of television. Wyss Associate Faculty member Wesley Wong who received his PhD in physics at Harvard is an assistant professor at Harvard Medical School in the departments of biological chemistry and molecular pharmacology and pediatrics and an investigator at the program in cellular and molecular medicine at Boston Children’s Hospital. His group develops and applies novel methods in single molecule manipulation and detection, combining approaches from a variety of disciplines including physics, molecular biology, chemistry, and engineering. Welcome, Wesley Wong, to Disruptive. Hi. It’s a pleasure to be here today. Wesley believes we all start out as scientists. I have a two year old at home and it’s amazing to see how she basically tries to like integrate her experiences to make sense of the world. How she’s always doing experiments with gravity at the dinner table, this type of thing. Though my mom always tells me that, before I was verbal, she would often see me sitting there counting my fingers so, I think I’ve always been kind of into quantitative science perhaps. I don’t have an external validation of that, as a scientist would say. In a toy store, as a nine year old, he found a book about physics for kids. I remember asking mom to buy it and flipping through it and just really falling in love with the fact that, you know, you could really understand the physical world. You can really understand the world based on simple principles. Maybe I didn’t process all this at the time but, I think it’s a miracle, when you’re at the stage in life where you’re trying to figure out the world, make sense of it, to realize that the world follows these simple rules that are actually understandable and like unchangeable and that’s somehow comforting in a way. Wong’s PhD is in physics and he admits to feeling like a bit of an outsider in the DNA self-assembly field. How did he get involved with building with DNA? There was very exciting pioneering work that was done by Paul Rothemund some years ago regarding this idea of DNA origami and, when I was a kid, I loved origami. You know, taking a piece of paper, folding it into a swan or folding it into a flower or something like that. When I learned about this, it was amazing to hear that you could actually do this at the nano-scale, and you, yourself, wouldn’t necessarily have to go in and make the folds but if you program the material just right, it will self-assemble and fold up in just the right way for you. So the nuts and bolts of it are quite simple. Just like with normal origami, you typically start with … Normal origami, you start with a piece of paper. Let’s say you want to make a swan. You basically have to come up with what steps of folding …what folding steps will actually result in a swan. With DNA origami, you basically start with a long strand of single stranded DNA and so, the typical one that a lot of people use is called M-13. Then, in order to get it to fold up in specific ways, what you then do is you mix it with what they call staple strands. As I said before, DNA likes to pair up in specific ways. You know, the A bases pair up with T’s, the G’s with the C’s. So what you can do is, if you have a small piece of DNA, and let’s say the first half is complimentary to one region of this long piece of DNA so it kind of will stick to there specifically and the other half is complimentary to another part of it… When you mix it together, that staple strand will basically bring those two parts close together. If you design just the right soup of staple strands, you can get that long single strand piece of DNA to fold into almost anything that you want it to. These days, in order to get something like a staple strand, it’s as easy as going to a website from a company that sells it, and then you type in the sequence you want like “gattaca, gattaca, gattaca” and then it arrives in the mail and you get a little vial with the staple strands that you want. So all you really have to do is mix together the DNA and then, through the magic of self-assembly and the beauty of thermodynamics or physics, these strands will self-assemble into the shape that you programmed them to. Isn’t that unbelievable? Wong came to this field because it had potential to help him in his research. One of the things that we wanted to make was a simple mechanical switch. One of the standard measurements that we’ll do in single molecule biophysics and, in particular, this sub-area of force spectroscopy is we’re often interested in what the mechanical strength is between two molecules. A lot of the vitality of life comes from these weak interactions between molecules in your body. So, as I said, DNA will pair together and come apart. What puts your nose here and your ear here? It’s like we have all these different cells and the cells have adhesion molecules on them and those adhesion molecules allow them to stick together in specific ways. One thing that my lab studies is basically the mechanical strength of these molecular interactions. We’ll pull on these things because, in some ways, it’s just like the kinds of experiments you might do in high school physics where you’ll get a spring scale and you pull on something to see how strong it is but much, much smaller. But this is at the nano-scale. [25:00] As a tool in order to do this, I had this idea of basically making a mechanical switch that jumps between two states. So, if two molecules of interest are bound to each other, the switch will be closed. Then, if that bond breaks, the switch will open. So, basically, making experiments simple by getting this kind of very specific binary signature. When I learned about DNA origami, I kind of felt like if William can make this amazing two dimensional structure, surely I can make this very simple mechanical switch. The amazing thing about DNA origami was from the time I had the idea for the molecular construct and how to do it to the time we basically had actual material, it was probably inside of a week. A lot of DNA origami starts with a long strand of DNA, typically we’ll use M-13 but, what we did is, instead of getting that to fold up into something like a happy face or something sophisticated, all that I wanted to do was to use it as basically a lanyard to hold molecules of interest near to each other. We’ll then put anchors at the two ends of that basically string of proteins and use those anchors as handles to grab those two ends with say beads that are held in optical traps. And if the proteins of interest that we’ve tethered to it are bound, the tether will be very short but, if the bond between those proteins breaks, the tether becomes longer. We can basically see this mechanical signature. We can break bonds and bring them back together again, and that’s our DNA nano-switch. So, or example, if we want to understand how strong a bond is between two molecules, we kind of have to go beyond the standard biochemistry that people do in a test tube to really understand the molecular machines that are in our body, to understand systems under force, understand systems out of equilibrium, and so, we use these single molecule force instruments in order to do that. These nano-switches give us a way to do that in a reliable way. Now, in this thing that you’re doing of finding out or measuring the force, what’s the bigger picture that that’s part of? Why are you doing that? There are a lot of systems in the body that I think you really need to understand them under stresses and out of equilibrium to understand how they work. One thing that we’re studying is how the body responds to injury. How processes like blood clotting take place. And so, you could imagine that cells that are going in your blood stream, they’re not like in a test tube. They’re subjected to fairly large forces and one thing people are learning is that, in order to understand how they work, you basically have to understand how they respond to force. Though Wong and his team built these tools to fulfill specific functions, they’re finding that they have a lot of other applications. I love my job. I love being a scientist. I love doing things that other people are not doing and come up with new ideas. One kind of mental game I like to play is like “What is a thing that would make the last thing I did totally obsolete?” and then try to do that next. And so I guess, when I was working on optical tweezers, it was a little frustrating to basically study one molecule at a time, and I kept thinking, “What is one way that we could do this maybe a thousand times faster and a hundred times cheaper?,” and that’s what resulted in this idea of the centrifuge force microscope, which is a way of instead of applying forces to one molecule at a time, to apply it to thousands at a time. I kind of like it because it’s super old school. If hundreds of years ago people even understood what a molecule was, they could have made the same device in some ways. That kind of led to the centrifuge force microscope but, as soon as that was working, I kept thinking, “What would be the thing that would make this, not obsolete but replace it for a large range of things?” Is there some way that we could also study the interactions between molecules in a way which is orders of magnitude even faster and orders of magnitude even cheaper? [29:25] Then I started getting hung up on this idea of, “Can we do instrument-free interaction analysis?” So, we tried a number of different things in the lab, and it was actually my post-doc and buddy, Ken Halvorson…We had made these DNA nano-switches for this other purpose and then, on the other side, we were also experimenting with different ways for making interaction measurements without requiring a microscope, without requiring lasers, without requiring any instrumentation at all. And it was actually Ken who noticed that the nano-switches would make a perfect candidate for that. [29:51] DNA nano-switches, they switch between two states in order to report if molecules are binding or unbinding and the way that they were designed was to read out their states at the single molecule level. But what we realized was that there is actually a much easier way to read out their states and that’s just by running a gel. If you’re not familiar with gel electrophoresus, it’s one of the most commonly used, inexpensive standard techniques in biomedical research. Basically, it’s very easy to do. You take what they call, in our case, a slab gel, which basically you could think of like a piece of Jello, and then you put it in an electric field, and then molecules in that piece of Jello will move at different speeds depending on their size but also depending on their topology. So when the nano-switch is closed, the DNA forms a loop. When the nano-switch is open, it’s just a linear piece and so they run reliably at different speeds, which really makes these techniques available to almost everyone because it’s really pennies of reagents and all you really need to do is be able to use a pipette and pipette things in and run a gel. [30:55] One thing in my lab I always like to think about is, can we kind of democratize technologies? Can we take things that only a handful of people can do who are specialists in the field and make those things available to everyone? And so, I think the DNA nano-switches are a great example of that. [31:10] We’re actually developing nano-switches as a way for a wide range of activities from high-throughput drug discovery to ultra-high-sensitivity detection. We have one version that changes shape in response to molecules in the environment and so, we can use it as a way to detect things in a very inexpensive but ultra-sensitive way, and we think that has a lot of exciting applications. Drug discovery as well. We’re looking at for drug candidates for specific types of interactions because we can, again, use the DNA nano-switches to do high-throughput drug screening. Wyss Core Faculty Member Peng Yin, prior to joining the department of systems biology at Harvard Medical School and the Wyss, graduated from Peking University with a Bachelor of Science in biochemistry and molecular biology and a Bachelor in Economics, earned a PhD in computer science and a Master’s of Science in molecular cancer biology from Duke University, and was a senior post-doctoral scholar in bioengineering and computer science at Cal Tech Center for Biological Circuit Design. Welcome, Peng Yin, to Disruptive. Peng Yin started graduate school in biology, but was quickly attracted to the emerging interface of biology and computer science – particularly to a group of scientists working in the nascent field known as structural DNA technology and DNA computing. Their idea is to engineer DNA as a synthetic material and to make artificial structures that can be engineered to demonstrate a particular shape or a particular dynamic behavior. Some of them can even be programmed to compute. I found it quite amazing that by merely specifying the digital information encoded in these DNA molecules, you can actually precisely prescribe their physical behavior. Over the years it has also become increasingly more clear that such ability to precisely engineer molecules in a digitally precise fashion holds tremendous promise to potentially transform technology and science and society. Peng Yin and his colleagues at the Wyss have developed what they call DNA brick self-assembly. The DNA brick is one particular method for making complex DNA structures in two dimensions and three dimensions. A DNA brick is a short piece of DNA that Peng compares to a Lego brick. Two DNA bricks can bind to each other if they share complementary segments. By programming the complementary segments of the binding pattern between different DNA bricks, you can design these DNA bricks to self-assemble into particular structures. If there is a certain target shape you want to design, you can engineer DNA bricks that can self-assemble into that particular pattern. I ask Peng Yin about the challenges they faced in developing the bricks. I think maybe one of the challenges is more a conceptual challenge rather than a technical challenge. An alternative way of making complex nano- structures using DNA is known as scaffolded DNA origami. Scaffolded DNA origami was the best known and dominant method for making complex and discrete synthetic DNA structures – from its initial report by Paul Rothemund at Cal Tech in 2006 until the DNA brick method was reported in 2012. Peng Yin explains that the basic idea with scaffolded DNA origami is to use a long scaffold strand, and design many short synthetic DNA fragments that can assemble with this long scaffold and tie it into a particular pattern that you want. It works very well, and the thinking in the field was that it’s an essential enabling feature for DNA origami… it works so well… is utilization of this long scaffold strand. It was thought to be an essential feature for making complex structures. So DNA brick is a departure from this paradigm. In the DNA brick assembly method, Peng’s team got rid of the long scaffold completely, simply programming the binding pattern into individual small DNA brick monomers. The success of DNA bricks actually I would say came as a big surprise to the field, and it really is a different way of thinking about how to make DNA structures. They initially demonstrated construction of 2-dimensional DNA brick structures by engineering the DNA bricks to bind each other in a co-planar fashion. Then later we modified the binding pattern engineering such that the DNA bricks could also bind to each other in a perpendicular fashion, and this enabled us to make discrete 3-dimensional structures. In the 2012 initial demonstration they reported 100 distinct different 2-D patterns on a 100 nano-meter scale, including a full set of letters of the alphabet and complex Chinese characters. [35:55] Artificial DNA structures can be interfaced with other functional molecules – proteins of particular interest, fluorescent dyes, etc. The medical field is particularly interested in using the DNA structures to enable nano-fabrication of inorganic materials. DNA itself is not necessarily a good electronic material or photonic material. However, if you can transfer the precise control of molecular geometry that you have with DNA structures to other diverse functional inorganic materials, this could enable many interesting applications. The team has invented a number of different ways to do this. In one method they were able to use DNA structures to produce graphene particles of a particular shape, and in another were able to use 3-dimensional DNA containers as a mold to cast inorganic particles of a particular 3-dimensional geometry. DNA is quite unique in the sense that by specifying the sequence of DNA components, we are able to engineer DNA strands to self-organize into compact structures of our choice. This is a quite unique property of DNA for nano-construction. Peng’s team first engineers a DNA container, and then attaches a tiny particle in the interior of the container. Under suitable chemical conditions, this small particle can trigger chemical reactions such that it can gradually grow into larger particles until the larger growing particle touches the interior surface of the DNA container. Now they engineer the DNA container to be rigid enough that the growth of the particle will be effectively stopped, thus copying the geometry of the cavity of the container. Peng Yin appreciates how a Wyss press release communicated this process. They identified a picture that shows a Japanese art of making cube-shaped watermelon and you do this by growing watermelon in a cube-shaped container. We’re essentially doing similar things, but on a nano-meter scale. Whatever the power of molecular programming, it isn’t to help us have quicker, longer lasting, smaller computers. Rather, it’s to use computers within molecules to do programmable molecular tasks. Like Wesley Wong, Peng Yin has been working on switches. One example that we recently reported is a very simple nano-mechanical device composed of, in this case not DNA, but RNA. It’s a similar molecule to DNA and from biology. This RNA nano-mechanical device, we call a toehold switch. RNA is particularly useful for engineering nano-mechanical devices that can function in living cells, which can be challenging to engineer with DNA. In some unpublished work, Peng’s team has been working to compose these simple toehold switches into more complex computing devices. This can be encoded in living cells…can be functional in living cells. Some of these RNA toehold switch-based computing devices can perform quite amazing computation. Maybe molecular computing devices could be useful for evaluating the internal states of living cells. Can you foresee being able to use this toehold switch to change the behavior of cells within a human organ to treat a flaw in the human computer? It turns out that the toehold switch, initially designed to function in living cells, can also function on the paper-based platform invented by James Collins’s lab at the Wyss. Basically what they did was that they took essential cellular components for making genetic networks and then they freeze-dry these components on a piece paper. When you add a drop of water on the freeze-dried component on the paper, then they can be functional as reconstituted genetic networks. What is DNA based microscopy and why is that an important field? Here I think we are referring to using DNA molecular probes to enable very high-resolution imaging and very high multi-plexing imaging. Multi-plexing refers to the ability to simultaneously visualize many distinct molecular species. Biological organisms are essentially molecular systems, in the sense that they are composed of bio-molecules. If you want to understand the biology in a different fashion, then fundamentally we need to get a molecular scale understanding. But when people try to visualize biology on the molecular scale, I think we face two broad challenges. One challenge is that we cannot see things clearly, so we have blurred vision. When we look at molecules, especially single molecules, we simply cannot see them very clearly. Another challenge is that we are partially color-blind, in the sense that we cannot see many different molecular species simultaneously. The study of molecular structures had reached a point where we were technically unable to go further because of those two challenges. Using DNA we’ve been able to push beyond those boundaries. Fluorescent microscopy is one of the powerful ways to image biology, but a fluorescent dye molecule can be less than one nano-meter in diameter. Looked at under a microscope, you see a big blob. This is known as a diffraction limit. In the past decade people have invented ways to bypass such diffraction limits to make it possible to visualize biological samples with very high resolution on the nano-meter scale. One more traditional way to do this … is to label the biological targets with particular fluorescent dye molecules that can be turned on and off or bright and dark using particular wave-length lasers. By stimulating the dye with wave-length lasers in a particular pattern, you can cause the dye molecules to start to blink. Typically this kind of imaging method involves sophisticated equipment that can cost you anywhere between half-a-million to one million dollars. The DNA-based imaging and one particular method called DNA-PAINT enables us to achieve such a blinking pattern using a common microscope. If there is a certain target you want to visualize, you can attach a small fragment of a DNA strand to the target. This is called a docking strand. Then you have dye-labeled complimentary strands in the solution that are called imager strands. The complimentarity between the docking strands and the imager strand enables the imager strand to transiently bind to the docking strand. When the imager strand transiently binds to the docking strand, the florescent dye becomes transiently immobilized, and under a microscope it appears as a bright spot. By precisely engineering the binding energies between the imager strand and the docking strand, and also by controlling the concentration of the imager strand in the solution, it’s possible to precisely engineer the blinking pattern of the targets. By sequentially localizing the center of the flashing spot, which responds to the position of the targets, you can construct very high-resolution optical images of the micro-targets. DNA painting enables you to visualize structures with a very high resolution. It solves one challenge for molecular scale imaging that is to enable one to see things more clearly. But another challenge is to label many different targets with distinct dyes and visualize them simultaneously. Typically when people perform fluorescent imaging, they’re able to visualize no more than six different species. Peng Yin’s team has developed a solution for this as well. Exchange-PAINT is the idea to enable one to simultaneously visualize many different structures and many different molecular targets. By introducing labeled imager strands one species at a time, you can sequentially visualize the distinct targets. After each stage, a simple buffer solution exchange flushes away a particular imager strand species. By introducing a new solution which contains distinct imager strand sequences, you can visualize another target species, and this process can be repeated sequentially many times. At the end of the imaging cycle you can put them all together and then you get a composite image that simultaneously shows lots of different targets. What is this going to allow us to do in terms of understanding biology? In terms of what this can enable us to do in studying biology, I think that there are many fascinating possibilities. Fundamentally this will enable us to visualize molecular structures so much more clearly. This will enable us to visualize many of them simultaneously. One direction is to visualize neuronal cells. Peng believes that to simultaneously visualize different proteins at the synapse of the neuron with high resolution could help us to understand how these neurons work. I think a very interesting direction is to visualize the chromosome structure in the nucleus. For example, human chromosomes in the genome can measure about two meters in length, but is compacted in a tiny 3-dimensional space on the micron scale. Now the ability to visualize the precise organization of chromosomes in the nucleus would be something quite fascinating and very useful for studying nucleus biology. Let me step back a bit to the bigger picture. How does what you’re doing with DNA compare to what nature does? Nature primarily uses DNA as a genetic information-carrying material. We are directly using DNA as a nano-scale construction material to make nano-structures, to make dynamic nano-systems, even to computation that uses DNA-based nano-scale molecular devices. I think this kind of physical control of DNA molecules to demonstrate a user-specified physical behavior is something very different from what nature does. So everything that we have been talking about really is taking something which occurs in nature, which nature developed, but using capacities that nature wasn’t using. There is also a very deep connection with what nature does, what biology does, and with what we are doing here, in the sense that the biological organisms are really a gigantic collection of molecular machines. The form and the function and development of biology is directed largely by the sequence information encoded in the genome. What are we doing here in the lab? Essentially we are doing something fundamentally very similar in the sense that by specifying the digital information of the sequence of the DNA strands, we are able to precisely engineer molecular structures and molecular machines, composed of DNA. In other words, although nature wasn’t using it for the function you’re using it for, the principle of how nature performed its functions is what you realized and what you’re using to perform other functions. Both nature and what we are doing in the lab are using digital information-carrying molecules to perform complex, molecular tasks. All three of today’s guests are joining with Radhika Nagpal, of Wyss’s Bio-Inspired Robotics Platform, to form a new Molecular Robotics initiative at the Wyss. Radhika was interviewed on another episode of DISRUPTIVE. I ask each of them about their hopes for the new initiative. First, William Shih. One general way of thinking about it is just increase the sophistication. We’re inspired by Moore’s Law, where we have seen this historical, amazing, exponential increase in sophistication of integrated circuits, and that’s produced the magical behavior of mobile phones and computers and tablets that we have today. That’s amazing and basically none of that would have happened without the incredible increase in complexity. On the molecular scale, we’re not trying to miniaturize anymore because the molecules are already small, but we’re trying to figure out how to build larger and larger assemblies of these very small components without the system just going completely haywire. Again, the example of: if you don’t program your jigsaw puzzle correctly, it’s just going to make a congealed mess. It turns out that’s not so easy to do. That’s what we spend a lot of our time thinking about. That the more complex the structure, the more challenge. There’s more things that can go wrong. So a big challenge is figuring out how to add more and more components without it going completely wrong. Will you be using some of the swarm robotics kind of things that Radhika’s working on? We’re trying to brainstorm with Radhika to see how maybe the kinds of algorithms she’s been developing might be successful. I think that certainly the general theme of trying to distribute tasks over many smaller components and then getting them to interact in a way that produces the desired behavior… In general terms, we’ve certainly gotten together with Radhika and we’re trying to figure out how we can best coordinate our activities. What are the challenges of engaging with another field, another concentration like that? I think one of the big challenges right now is just in terms of the sophistication of the building blocks that people like Radhika in the robotics field … Typically the building blocks they work with versus with what we currently have available in the molecular world. With Radhika, her frame is: we have these extremely sophisticated computers and mobile phones and that sort of thing, but what if we take a step back and take something that’s like a crappy mobile phone that’s not that powerful compared to today’s best, but if we had a thousand of them and we could get them to communicate with each other, something really functional and amazing will emerge. Even the crappy mobile phone that they’re using for each individual robot is still vastly more sophisticated than the kinds of things we would call an agent today that we’re building out of nucleic acids. Eventually our goal is to make things that are that functional, and we know it’s possible because we have things like immune cells floating around, but it’s going to take us some time in order to get to that level. [52:24] One of the challenges is: how do we translate some of the insights that people in Radhika’s field have to much simpler building blocks, because we don’t have building blocks that are as sophisticated as the least sophisticated ones that she’s normally dealing with. I think eventually we will. A hundred years from now, certainly I believe that we will have the know-how to create tailor-made cells that we can program in the same way that we’re programming microscopic robots today. Why is it going to take that long? There’s a lot of reasons why it’s more difficult to work with very small things. We don’t have little robot arms that can manipulate things. There’s a lot of thermal oscillations that we don’t understand how to control. It’s just a different regime on the molecular scale. It’s much harder to work in. But eventually we’ll have the tools to do that. It’ll take time. [53:15] I think having the metaphor of the robot, to me, is ambitious and encapsulates a lot of what we’re trying to do. Wesley Wong sees nano-switches already displaying a lot of the properties of molecular robots. Right now the nano switch, in some ways, you can think of as a proto-molecular robot that can sense things, can respond, and can report. But you could imagine, if you think of those principles, you can do things that are much more sophisticated than just determining whether two molecules are bound or unbound. Right so, something that can do those things is a robot. Yeah – and listening, in some ways, to the user. Otherwise, you get into these crazy sci-fi type situations. Where they’re on their own. That’s right and so, I think a lot of the structures that we’re making have those same properties – but are smaller. In a sense, even the DNA nano-switch. I mean, we program it. We control it. It responds to the environment. It senses things and changes it’s topology and shape in response to it and then reports that back to us. In a sense, it’s a very, very simplistic type of robot. [54:59] I feel that getting the language right will hopefully help people think about not just what can be done or has been done – but what could be done. Peng Yin also sees the Molecular Robotics Initiative as an inviting pathway for the future. We are able to program the structure’s dynamics and also using the structures and devices to program other functional components, including programming florescent, programming light to enable the very high resolution microscopy, and programming inorganics for nano-fabrication, and even programming living cells for future applications. But I think we are really just scratching the surface of what molecular programming can eventually enable us to do. Peng believes this initiative grows out of the culture and environment, as well as the people that make up the Wyss Institute. Working at the Wyss exposes one to all these fascinating ideas, inventions, discoveries. It feels like an intellectual hub. It really helps to bring out the best of one’s own creativity. And he points out the Wyss is not just about stimulating creativity, but also about translating intellectual breakthroughs into commercial products for the wider world. In my own life, we recently – working with Wyss – have spun off a start-up company called Ultivue to commercialize the DNA-based imaging technology. That’s when we were talking about the DNA-PAINT and that sort of thing. That’s what you’re talking about. That has led to the creation of a start-up? That’s right. In essence, I think the ability to bridge academia with industry to enable the broader dissemination of innovation is very powerful. There is something quite unique about this and it’s really wonderful. Wesley Wong is convinced that the Wyss brings out his best. I feel like everyone has potential. Everyone has specific gifts but, in order … – this sounds too corny but, it’s sort of true – In order to actually enable those things to be realized, for society to benefit from the gifts that each person has, there needs to be, in some sense, some enabling infrastructure in place. I think that people at the Wyss have worked very hard at trying to create the kind of infrastructure that can enable innovation, cross-disciplinary activities, collaborations. Again this molecular robotics initiative has grown out of a close collaboration I have with some of the other people. I talk and work with William very regularly, and, without this Wyss clubhouse and infrastructure and resources available and opportunity for us to get to know each other and work together, that would have never happened. For the future, I’m really excited about the potential of DNA origami and other types of DNA self-assembly techniques. In some ways, being here in Boston and part of the Wyss Institute, I wonder if people in Silicon Valley felt this way shortly after the transistor was invented, because I feel like what we’re doing right now… probably, what people are doing is laying the foundation for the future. But I think, at the end of the day, the types of applications that people will see from this ten, twenty years down the road will be so much more sophisticated than what we’re doing now, that I feel very excited to kind of be where I am now at this point in history – because the possibilities are so huge. Like many at the Wyss, William Shih simultaneously focuses on two very different time horizons. I don’t know who said it first, but ninety-nine percent of the technology of tomorrow is based on one percent of the technology today. Because there’s so many pressures to publish papers and produce this and that, people are presented with incentives to focus sometimes too much, I think, on the things that are only going to work in the next few years. We need to reserve some…a lot of our resources for thinking about longer term. 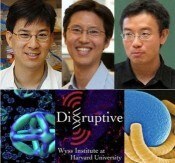 You’ve been listening to DISRUPTIVE: MOLECULAR ROBOTICS. I’m Terrence McNally and my guests have been William Shih, Wesley Wong, and Peng Yin. You can learn more about their latest work with DNA as well an exciting range of other projects at the Wyss website – wyss.harvard.edu – that’s W-Y-S-S dot Harvard dot edu – where you’ll find articles, videos, animations, and additional podcasts. My thanks to Seth Kroll and Mary Tolikas of the Wyss Institute and to JC Swiatek in production, and to you, our listeners. I look forward to being with you again soon.